Start by deleting the default cube from your scene. Press Shift+A to display the “Add” menu. Select Mesh > UV Sphere. 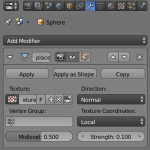 Choose “Sculpt Mode” from the mode menu and select “F Snake Hook” as brush. The brush can be resized by pressing F and scrolling the mouse wheel. Clicking with the left mouse button accepts the change. Now, hold in left mouse button and drag along the surface. Repeat this on different places on the surface, to get something similar to the object shown above. Next step is to connect the tree to the soma. This can be done by selecting the tree you have created (resize if necessarily by pressing S and scrolling the mouse wheel) and place it on one of the soma branches. 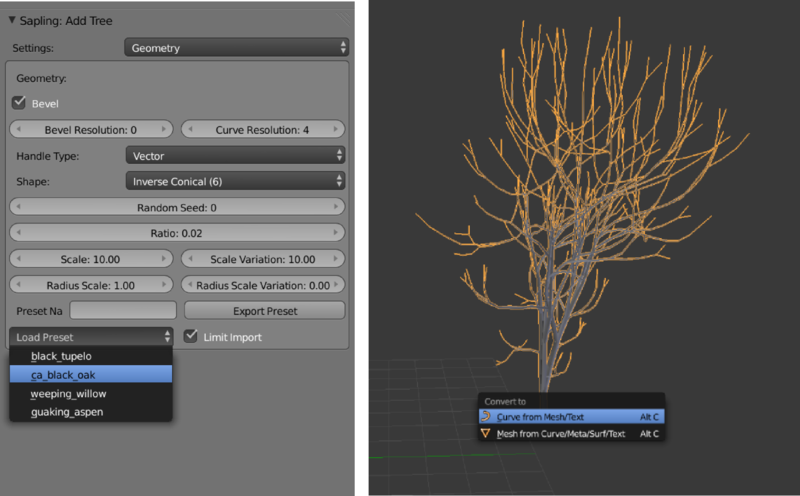 Create thereafter more trees (Ctrl+C and Ctrl+V) and place them on the other branches. You can join the dendrites and the soma by holding in Shift and right click on the soma and all the trees, and thereafter press Ctrl+J. Press Shift+A to display the “Add” menu. Select Mesh > cylinder. Press Tab to switch to “edit mode” and select “face click” (see figure). Click on the top of the cylinder to select the top face. Press E and move the mouse to extrude. Thereafter press S and move the mouse to make the face smaller. Extrude and resize again, but this time inwards. Finally extrude inwards one more time. Repeat the steps above for the bottom face of the cylinder as well. Go back to object mode. Press Shift+A to display the “Add” menu. Select Curve > Path. Press Tab to switch to “edit mode” and form the path as you want. Press Tab to switch back to “object mode”. Select “object data” on the right hand side menu and use the options shown in the figure below. 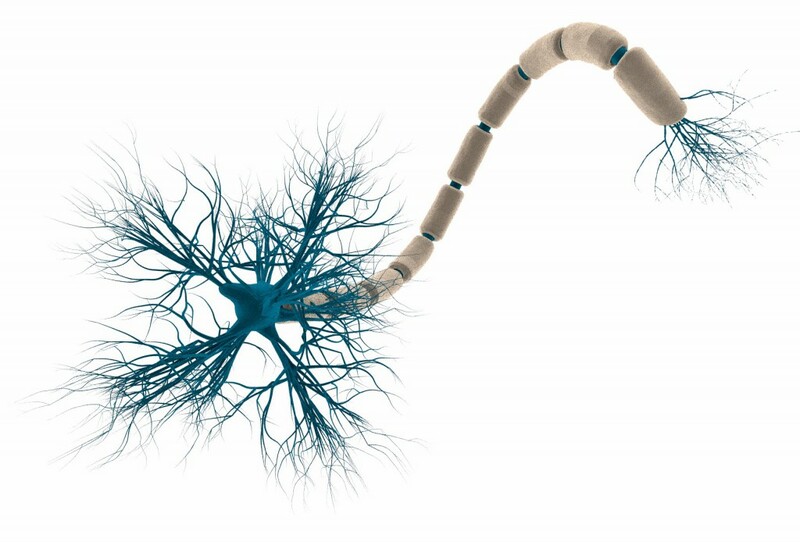 Next step is to connect the myelin to the axon. First, press Tab to switch to “edit mode” and select the first point on the path object (see figure). Press Shift+S and select “Cursor to Selected”. Switch back to object mode, press Ctrl+Alt+Shift+C and select “Origin to 3D Cursor”. Thereafter, select the cylinder first and then hold in Shift and select the path-object (axon). Press Ctrl+P and select “object”. Finally, press Alt+O. Now, select the cylinder and choose “add modifiers” in the menu on the right hand side. From the menu choose “Array” and “Curve”. Use the options shown in the figure below. Use a “Displace” modifier for all parts of the neuron, with the options shown below. For the shader use a “Mix shader” (make sure you’re using “Cycles Render”) with the options shown below. Choose the colors as you want. In the figure below you see the final result. I have used Hex: 00CCFF and Hex: FEE6CE as colors for the soma and the myelin, respectively. The above images are licensed under a Creative Commons Attribution-ShareAlike 4.0 International License. Utrolig kult! Det skal jeg prøve å lage selv! This is such a useful information. But I cannot find a “Mix shader” (make sure you’re using “Cycles Render”). where can I find it? Do I have to add addons or something like that? 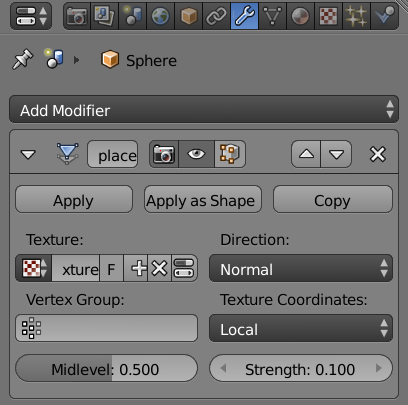 If you’re using Cycles Render and already have a Displace modifier, you can find it in the Material tab. Just click on “Use Nodes” first under the Surface menu in this tab. You should then be able choose Mix shader and see the same menu as in the figure above. OK, thank you It is really helpful. You are such a great guy.